Despite the popularity of Japanese cuisine, many people are still hesitant about eating one particular dish: sushi. Even serious foodies are sometimes cautious about ordering this delicacy at certain restaurants because they are afraid they won’t like the taste of the raw seafood or other ingredients in it. • Maki – Rolled rice with fish and vegetables as filling and covered with a sheet of roasted seaweed or nori. It is then cut into bite-sized pieces. 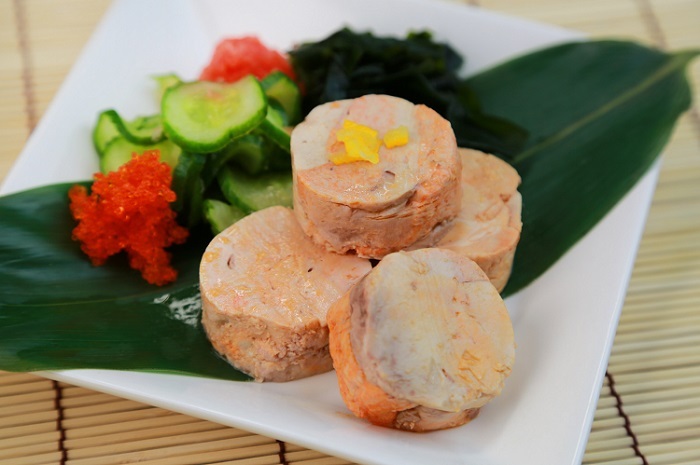 • Uramaki – A seaweed wrap is filled with fish and vegetables then covered with rice. It is also served in bite-sized portions. • Temaki - Sushi that has been hand-rolled into a cone shape to make it easier to eat with your hands. Since it’s your first time to eat sushi, reduce your apprehensions by ordering rolls with ingredients you already like, know or have tasted. If you already like salmon, consider ordering sushi with smoked or cured salmon. The smoked or cured salmon isn’t too different from the taste and texture of the cooked version so there’s a high chance you will like it. If you don’t like raw seafood in the first place and you think a roll may taste too fishy, opt for sushi that has milder ingredients such as tuna, red snapper, or scallop. California roll (sushi with crab, avocado, cucumber, and sesame seeds) is often a safe option for first-timers since most people are likely familiar with and have tasted these ingredients. You also won’t go wrong with ordering rolls that come with veggie or fruit fillings. Most Japanese restaurants today serve kappa maki or cucumber sushi rolls. Other options you can choose from are avocado, sweet potato, and mushroom sushi rolls. By trying different veggie sushi rolls first, you can slowly get used to this style of food. You can then decide later if you want to try the other menu items. A dish of sushi always comes with wasabi or Japanese horseradish. This is a green ball of paste which is very spicy and has an extremely strong pungency. Because it is spicy, be careful in adding this condiment to the soy sauce especially if you’re not particularly fond of hot flavors. Sushi is also served with pickled ginger. These are the thin, pink, or white tan slices of veggies you see on the side of the plate. You are supposed to eat this to cleanse your palate in between bites. Lastly, soy sauce always accompanies sushi rolls as well. To avoid overpowering the roll with this salty condiment, avoid submerging the sushi in soy sauce; just very lightly dip it. • Before eating, make sure your hands are clean. This is because you can eat sushi with your hands if you’re not comfortable with using chopsticks. • To have the perfect dipping sauce, pour a small amount of soy sauce and a bit of wasabi in a small bowl. Mix them together. • When dipping the sushi, make sure you dip the fish or topping first and not the rice. If you dip the rice first, the roll won’t stay together and you will have a harder time eating it. • If the sushi already has sauce, do not dip it in the soy sauce anymore. Try enjoying it as is — seasoned and served by the chef. • Most food experts recommend eating sushi in one bite. However, if the portion is too big, you can eat it in two bites. • Once you’ve finished your roll, eat a slice of ginger to refresh your palate. Keep eating this in between bites. However, avoid eating it in the same bite as the sushi. Also, do not eat too much of this palate cleanser since it will overpower the taste of the sushi. If you’re still overwhelmed by the menu choices or you’re not sure you will like what you will order, don’t hesitate to ask the chef for his or her recommendations. In case your dining companions have already tried sushi before, you can also ask them what items they love. You may end up liking them, too. Franck Mottais is the Operations Manager at Tourism Development & Investment Company or TDIC. With a true passion for food and beverage operations, Franck's personal goal is to consistently deliver the highest quality of guest service and effectively run distinguished establishments such as KOI Restaurant & Lounge and Boa Steakhouse in Abu Dhabi.